Bring your group aboard its own private Old Town Trolley and experience the excitement of our wrecking days, the romance of our architecture, the frivolity of our festivals and the eccentricities of our independence. Your private tour guide will lead you through our picturesque streets as they reveal the treasures that have and still do make Key West the magical island basking in the Caribbean sun. Combining the tour with visits to attractions will maximize your time. Relive the lucrative salvage operations, walk in the footsteps of Presidents, pet a live shark, or be inspired by Hemingway – just give us a call and we’ll custom design your visit aboard our classic Victorian vehicles. Need dinner or wedding transfers? Not a problem. 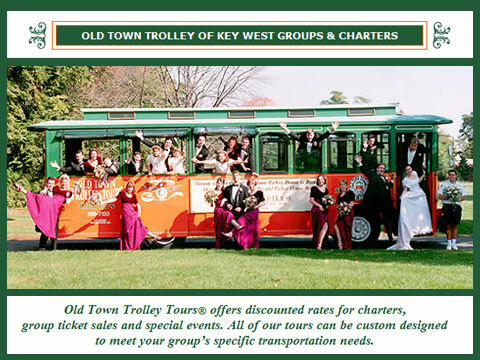 Our Transportainment options are a whimsical yet practical solution to get your guests to your event on time and in classic Key West style.